Until I learned how to poach an egg in the microwave, I’d pretty much given up eating them at home. Since one of my favorite breakfasts is Eggs Benedict, I’d only had it when we’ve gone to a restaurant for breakfast — something that doesn’t happen very often. Then I found out how easy it is to poach an egg in the microwave. Even though I’m not up to making Hollandaise Sauce very often I’ve still been enjoying poached eggs on toast a couple of times a week — it’s just that easy to make! NOTE: Follow these instructions at your own risk. Some readers report their eggs have exploded in the microwave, while others have not had any problems. If you’ve tried poaching an egg on the stove you know what it’s like: you bring a pan of water to simmer, add a splash of vinegar, crack an egg on a saucer and while swirling the water, slip the egg into the liquid. Three minutes later you scoop the egg out of the water with a slotted spoon. That’s all there is to it in theory. In reality, my eggs would turn into wispy things with overcooked yolks, so I usually wound up eating oatmeal instead. Not anymore! Please note that you must use a coffee mug, not a teacup. I’ve made poached eggs in the microwave using 6- and 8-oz mugs without a problem, both in 900 and 1200 watt microwaves. You want enough water to cover the egg by 1 inch. This should leave a couple of empty inches above the water’s surface in your mug. In my mug, filling it halfway works best. If you don’t have that much room, use a bigger mug! Cover it! Use an actual saucer or plate, not a paper towel or plate, to keep the heat and liquid in the mug so your egg actually poaches. If you don’t, your egg will explode rather than poach. •Top a green salad with a poached egg to turn it into a meal. •Serve it on asparagus with bacon crumbles. •Slide it onto black bean burgers. •Or top a Baja Sliders with Green Chile Mayo with one. •Serve it alongside homemade breakfast sausage. •Add it to a bowl of ramen noodles with broccoli florets and diced carrots. 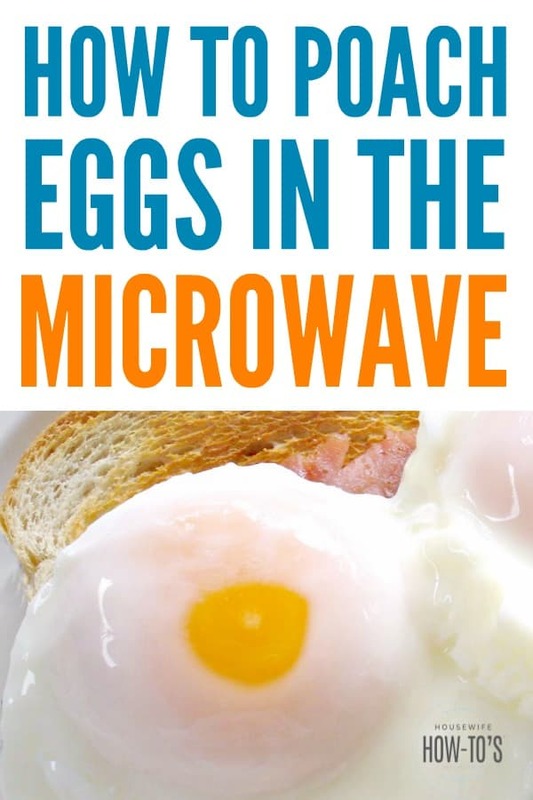 Enjoy a hot breakfast even when you’re in a hurry with this quick and easy method to make poached eggs in the microwave! Fill a straight-sided coffee mug halfway with water. Crack an egg and let it slide down the side of the mug to the bottom. (This keeps the yolk intact.) Make sure there’s enough water in the mug to cover the egg by at least 1 inch with 2 inches of space above it. You must have that space at the top — if not, use a bigger mug — or your egg may explode! Place a saucer (not a paper plate and not a paper towel) over the top of the mug and microwave it on HIGH for 1 minute. Wait 15 seconds for the water to stop boiling before opening the microwave and checking the egg for doneness. Gently tilt the mug and remove the egg carefully with a slotted spoon. Serve immediately. Use a straight-sided mug. Don’t forget to use a saucer on top of the mug. BE SURE TO WAIT AT LEAST 15 SECONDS AFTER COOKING BEFORE YOU OPEN THE MICROWAVE OR CHECK THE EGG. Actually, the Hawaiian dish with rice and gravy is called a Loco moco ???? thanks, this is exactly what I was looking for. I found that when i tried it the first time I put it in for 45 seconds and it wasn’t done so put it pack in for another 10 seconds and it still wasn’t done. So 10 more seconds and it was way overdone. So I tried is again a full 60 secs in one shot and let it sit in the cup for about a minute after and it was perfect! Nice and quick! I found semi cooked whites with half the yolk completely cooked. I mean it’s similar to a poached egg, but definitely no substitute. I would do less time to get the yolk right, but then the whites would be inedible. 🙁 I guess I will try buying one of those little devices designed for this. 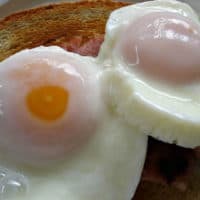 I never tried poached eggs and was watching a cooking show and thought I wonder if you can make it in a microwave first one came out yolk was to my desire overcooked second one just right . I put it on a chicken fried chicken steak with country white gravy omg my taste buds totally satisfied ?thanks for the tip. Poached egg on chicken fried steak with gravy? That’s some good eating right there! My mother used to make a recipe for us that still brings delicious memories. Golden Rod Eggs. She used a white sauce made with butter and toasted flour for a roux. But works as well with milk gravy and serve it over toast then either poached eggs or boiled eggs pushed through a potato ricer served over the white sauce or gravy over the toast. A real tummy warmer. You just brought back a delicious memory for me, too! We’d make that and add a pinch of dry ground mustard to the roux, sprinkle on paprika, and call them Poor Benedict’s Eggs. We eat poached eggs every week and have found that the Nordicware microwave egg poacher works best for us. Each device can poach two eggs and we use two devices at once. In our Panasonic 1200 watt microwave, four eggs cooked to set whites and thick yolks takes about 1:15 for large eggs. I’ll have to take a look at those, Gerry. I love poached eggs. Thanks! Great idea! I use a bowl and plate cover to microwave an egg for 55 seconds. That gives me a perfect diameter egg for my favorite breakfast sandwich. Tastes way better than McD’s! That’s it: Loco Moco. Yummy stuff but definitely not diet-friendly. Thanks for the tip about using a bowl and plate! Loco Moco is diet friendly if you don’t eat anything else for 2 days. ???? Mine blew up in my microwave too! Put it in for a min. On high. Maybe because the mug was smaller than most..? BTW it’s not letting me rate this recipe. 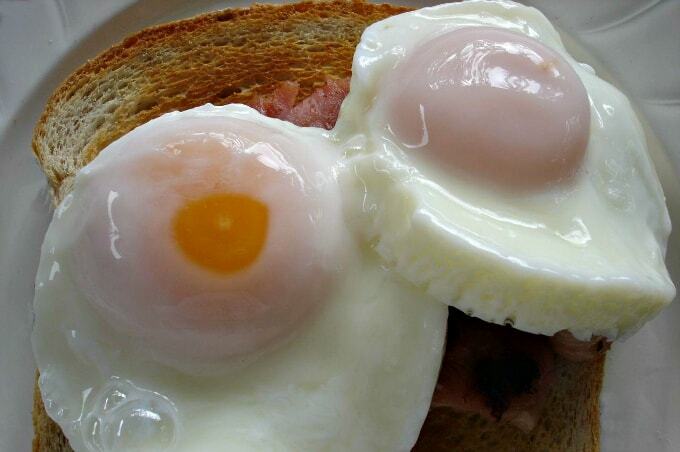 I love all the ideas for how to eat a poached egg! I’m sorry that happened. I think you’re right: the mug size matters. I don’t know you, but I feel like I love you and I thank you for running this site for slobs like me. You have much improved my domestic goddess skills, and even made it a little fun. I also wanted to extend my deepest sympathies to you and your family during this time. Thank you for the kind words, and the condolences, Kimberly! I got a little impatient and put two eggs in for 3 minutes. Oooops. Oops, indeed! Hope it all came off okay.